Quality leather Ascot Polo Set with Stainless Steel fittings. This Ascot Polo Set contains all seven pieces of leather bridlework required for POLO. Ascot All leather Draw Reins with Stainless Steel fittings and leather tabs. 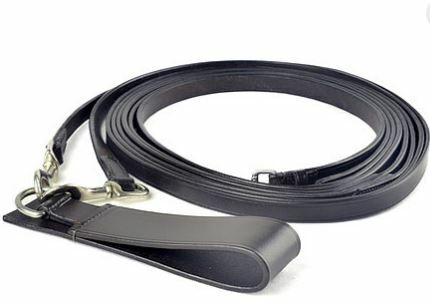 These long leather Draw Reins are 5/8″/16mm wide & feature a trigger hook at each end, for ease of fastening. They have a leather tab that slides over the girth. The reins pass through the bit rings (from the inside to the outside) and up to the riders hands. Draw reins encourage the horse to lower its head, bringing it towards the vertical to promote the correct development of his back muscles. Draw reins should only be used with a snaffle bridle to which an independant set of reins is also attached, and the rider should release the pressure when the horse lowers its head.